Farmers can't predict their annual corn harvest with certainty, but with the help of new research from Michigan State University, they can now pinpoint specific parts of their fields that consistently produce either good or bad yields. Not only will this save them time and money; it will solve one of the most widespread environmental problems facing crop-producing regions—nitrogen loss. "This is the first time anyone has been able to quantify how much small-scale yield variability there is in the United States Corn Belt," said Bruno Basso, MSU professor of ecosystems science and lead author of the study. "Our findings allow farmers to know exactly which portions of their farm fields have stable yields—which allows them to better manage their variable fields to save money, reduce fertilizer losses and lower greenhouse gas emissions." Basso and his MSU co-authors—Guanyuan Shuai, Jinshui Zhang and Phil Robertson—discovered that almost all fields have certain areas with consistently low or high yields, meaning much of the fertilizer added to low-yielding areas will go unused and be lost to the environment. At the same time, unused nitrogen is lost to the environment rather than taken up by the crop. The study shows that lost nitrogen from 10 Midwest states totals nearly $1 billion of wasted fertilizer and 6.8 million metric tons of greenhouse gas emissions annually. 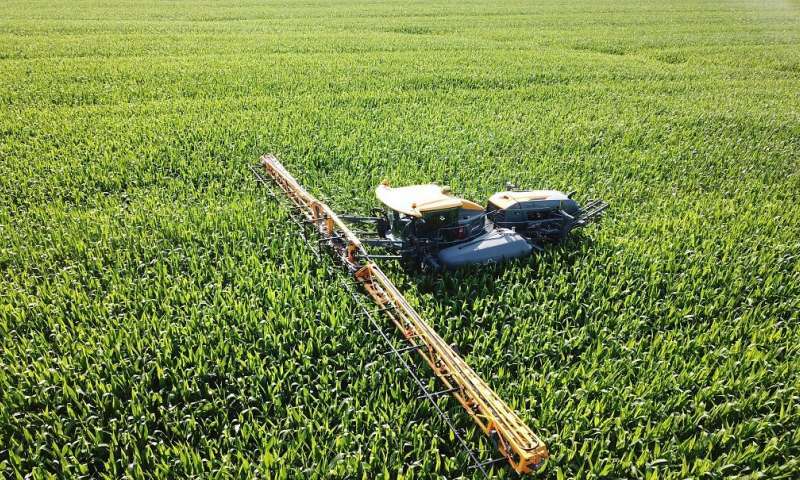 The research, published in Scientific Reports, is the first to quantify nitrogen losses from the low-producing areas of individual fields. Basso's team used satellite imagery to measure eight years' worth of sub-yield fields for 70 million acres of farmland in the Midwest. The analysis provided the researchers with a finely resolved image of the entire Midwest's corn production, Basso said. "We color-coded pixels in the images to see where the crop was stable and high-yielding, where it was stable and low-yielding and where it was unstable year-over-year," Basso said. "In total, about 50% of the subfield areas we analyzed were stable and high-yielding. The underperforming and the unstable areas each represented about 25% of total farmland." By assessing how much Corn Belt farmers spend on fertilizer that goes unused, the authors concluded that the best outcome—both for farmers and the environment—is to avoid fertilizing the underperforming areas of each field. In fact, Basso said, it may be better from an economic standpoint to leave these areas unfarmed, to plant them with conservation grasses or in the future, with perennial bioenergy crops. In any case, Basso said that time and resources should be focused on farming the portions of the fields that are high yielding or that are unstable—high yielding some years, low-yielding others. The unstable areas can be still be managed well with careful in-season management of nitrogen fertilizer, he said. "By putting big data at the service of sustainability, we are now able to provide farmers with a prescription (Rx) map of nitrogen fertilizer for their fields, which can completely change how and where they focus their efforts," Basso said. "Farmers want to be good environmental stewards, and these findings give them an additional way to do so—to avoid over-fertilizing areas of fields that will lose the most nitrogen to groundwater, rivers and streams. Nobody wins when fertilizer is wasted on areas that won't produce. Once farmers identify these areas, they can both save money and help the environment." "The work demonstrates that overfertilization of consistently low-yield croplands is very costly to the industry and offers a valuable approach to meeting the farming industry goal of precision nitrogen management. Importantly, what's best for farmers is also best for the environment," said Colette St. Mary, a director of the National Science Foundation's Long-Term Ecological Research program. "The findings provide practical recommendations based on a convincingly complete data set coupled with remote sensing to persuade farmers that matching low crop yields from stable low-yield areas could eliminate seasonal excesses in reactive nitrogen," said Jim Dobrowolski, National Program Leader for Water at USDA-NIFA. "With this research, MSU's team helps the farmer's bottom line, while simultaneously reducing greenhouse gas emissions and maintaining water quality. It's a 'win-win-win' solution."